Weighty Matters: Biggest Loser Pediatrician Joanna Dolgoff Promotes Unsafe Weight Loss to 7 Million Viewers? 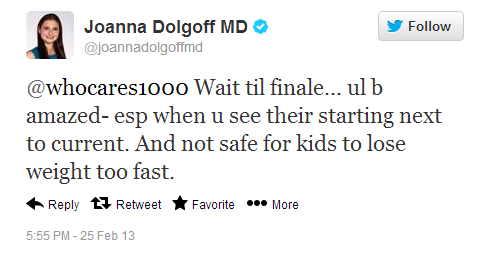 Biggest Loser Pediatrician Joanna Dolgoff Promotes Unsafe Weight Loss to 7 Million Viewers? This story will be told primarily in tweets. Not mine, but rather Dr. Dolgoff's. So is rapid weight loss in children safe? Not according to Dr. Dolgoff. Here's her tweet from January 7th where she appropriately cautioned a 15 year old that losing 36% of her body weight in just 29 weeks and 3 days was not safe. It's a message reiterated regularly and appropriately by Dr. Dolgoff in her recent Twitter stream. The reason Dr. Dolgoff cautions against rapid weight loss in children is twofold. Firstly the only way to lose weight rapidly is to take on extremes of effort - dramatic under-eating and massive over-exercising - neither of which represent a sustainable strategy for anyone at any age. More importantly though, when it comes to rapid weight loss in children it's thought that rapid weight loss potentially risks negative effects on pubertal development and on lean tissue, while simultaneously putting children at greater risk of developing eating disorders. "Child weight loss is very different from adult weight loss for many reasons. First and foremost, children need a sufficient number of calories to support their growth and development. We cannot limit fat as much as we do in adults because children need fat for continued brain development. We also don’t want to limit carbohydrates which are essential for growth and energy. In fact, most studies show that low carbohydrate diets are neither safe nor effective for children. It is not safe for children to lose weight too quickly. Weight loss in children must be closely monitored by a doctor to make sure that no nutritional deficiencies are developing and that growth and development is appropriate. We recommend that all patients see their pediatricians routinely while following our program. We aim for a slow, steady, and healthy rate of weight loss, approximately one half pound to one pound per week. It is not safe for children to routinely lose weight more quickly than that. Of course, there may be some weeks when your child loses more than one pound but in general, sticking to a half pound to one pound per week is ideal. Remember, your children are still growing. So even if they don’t lose a pound (but rather maintain their current weight) and continue to grow, they will get thinner. We call this “growing into their weight”. In fact, for younger kids, we don’t aim for any weight loss; we aim for weight maintenance and continued growth. "Ok, so Dr. Dolgoff really isn't a fan of rapid weight loss in kids. 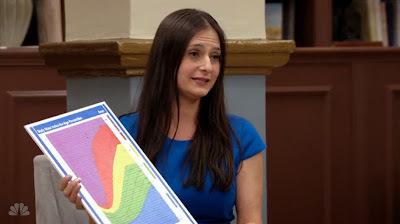 "I have here a body mass index curve, it's a way to measure levels of body fat, and when we first met you, you were in the purple and at a real risk for medical problems. In just a few months of making healthy choices, you have gone from the purple all the way down to the yellow. Biingo has lost 25% of his body weight." Then at the finale this past Monday we found out that 13 year old Biingo lost 43lbs in the 22 weeks, 13 year old Lindsay 47lbs and 17 year old Sunny 51lbs and though they didn't announce percentiles I'd venture that each and every one of their losses represented somewhere in the neighbourhood of losing near 30% of their body weights in just 22 weeks. For the show's children to lose 30% of their body weights in just 22 weeks puts their results right in line (and even in some cases exceeding) those of the show's adults, especially when considering not fully grown 13 year olds' resting energy expenditures are likely less than those of fully grown, taller, heavier, adults. What that means to me is that the kids, while not living on the ranch but while under Dr. Dolgoff's supervision and oversight, were as or more extreme in their weight loss efforts than the show's over-the-top, run till you puke, never eat a cookie, competing for $250,000/$100,000 adults. And while these massive weight losses in barely pubertal children may have put the kids at personal risk, what of the viewers' children? Roughly 7 million people watch The Biggest Loser, which means 7 million people have just been taught that children, if pushed hard enough, if they just want it badly enough, can lose dramatic amounts of weight in truly rapid fashion and that pediatricians support that degree of loss. I wonder how many parents who watched The Biggest Loser this year are going to start riding their overweight children and forcing them to undertake incredible amounts of exercise while simultaneously severely restricting their diets thinking that's their kids' tickets to slim? So are there any thoughts out there as to why Dr. Dolgoff's caution against rapid weight loss for the 15 year old hoping to lose 36% of her body weight in 29 weeks didn't apply to the three children she regularly reports on Twitter that she "loves" whose care she was responsible for overseeing while on The Biggest Loser? Or why she's comfortable serving as a cheerleader for a show that teaches America that rapid weight loss in children is awesome when she clearly appears to have at least once thought differently? Has she simply changed her mind? American Academy of Pediatrics - would still love to see some actual leadership from you on this one. You need to speak up about kids on this show. You're failing them on this.